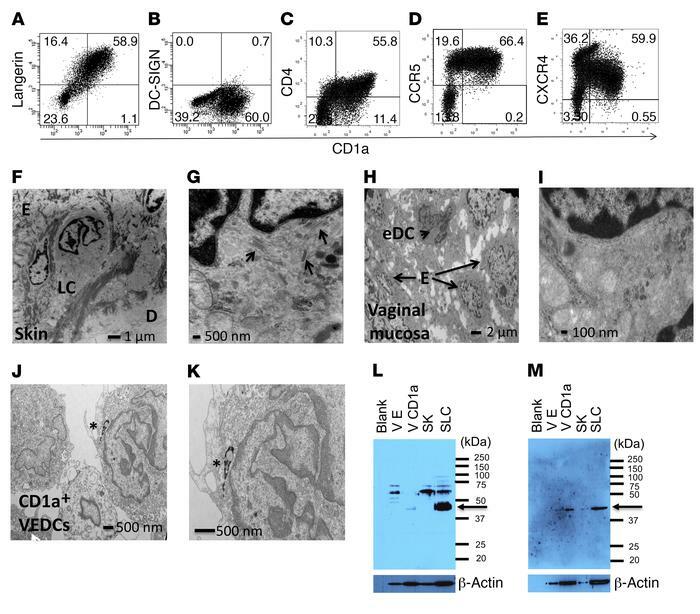 Vaginal CD1a+ cells are a unique DC subset. (A–E) Representative dot plots from a minimum of 3 independent donors show staining for CD1a along with (A) Langerin (CD207) , (B) DC-SIGN (CD209), (C) CD4, (D) CCR5, and (E) CXCR4. Numbers in the quadrants show the percentage of positive cells. Due to limited cell quantities, the CD1a+ VEDCs in these plots are not all from the same tissue. (F and G) Electron micrograph (EM) of the skin with markers denoting epithelium (E), Langerhans cell (LC), and dermis (D). The arrows point at morphological structures consistent with Birbeck granules (BG). (H and I) EM of vaginal tissue demonstrating epithelium (E) and a nucleated cell consistent with an epithelial-based dendritic cell (eDC). (J and K) EM of CD1a+ VEDC pellets with asterisks showing the CD1a beads. (L and M) Two independent Western blots of cell pellets from different vaginal tissue and skin donors. The vaginal epithelial (VE), vaginal CD1a+ cells (V CD1a), skin epithelial (SK), and skin Langerhans cells (SLC) were probed with Lag antibody (Takara), which is deemed specific for BGs. Expected band for BG binding is at 43 kDa, shown by arrow. Bottom blot shows probing for beta-actin.